29 Gloucester is located on the east side of Gloucester, between Commonwealth and Newbury, with 282 Commonwealth to the north, across Alley 432, and 31 Gloucester to the south. 29 Gloucester was designed by architect Samuel D. Kelley and built in 1882-1883 by Samuel Tarbell Ames, builder, for Charles Anthony Morss, a wire and cable manufacturer. It was one of four contiguous houses (29-31-33 Gloucester and 279 Newbury) built for Charles Morss for speculative sale. He and his wife, Mary Elizabeth (Wells) Morss , lived at 323 Marlborough. Click here for an index to the deeds for 29 Gloucester. 29 Gloucester was the last of the four houses built; 31-33 Gloucester and 279 Newbury are shown as structures on the 1883 Bromley map, but 29 Gloucester is shown as a vacant lot. When the completed houses at 29-31-33 Gloucester were sold by Charles Morss, he included a 3 foot 6 inch easement at the rear of 29-31 Gloucester to provide access to the alley for all three houses. On March 9, 1883, 29 Gloucester was purchased from Charles Morss by Anna (Berwick) Manning, the widow of Rev. Jacob Merrill Manning. Jacob Manning had been pastor of Old South Church until 1881 and had died in November of 1882. Prior to his death, they had lived at the Old South Church parsonage on Boylston. 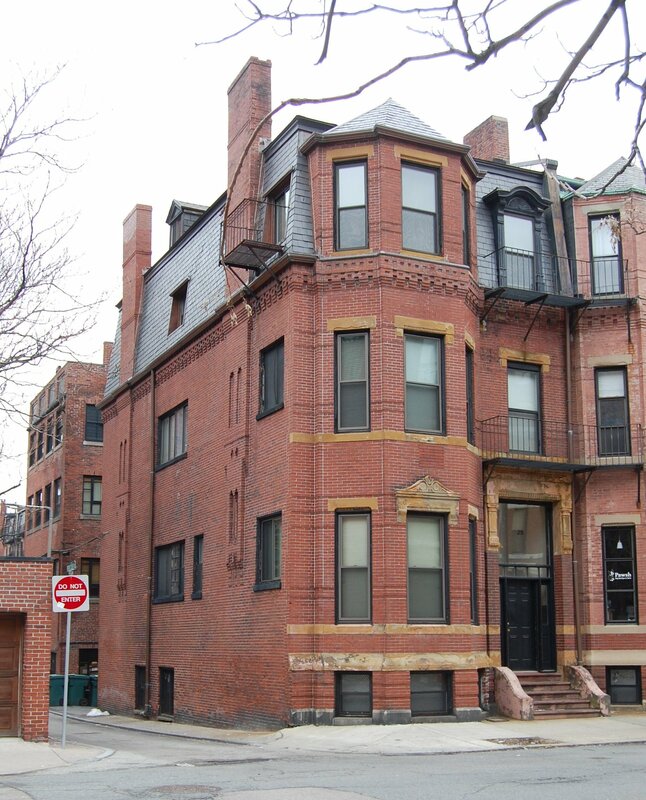 She continued to live at 29 Gloucester during the 1889-1890 season, but moved thereafter. She continued to own 29 Glocuester and lease it to others. By the 1890-1891 winter season, 29 Gloucester was the home of Mary (Eldridge) Bangs, the widow of William A. Bangs. She previously had lived at The Copley at 18 Huntington. 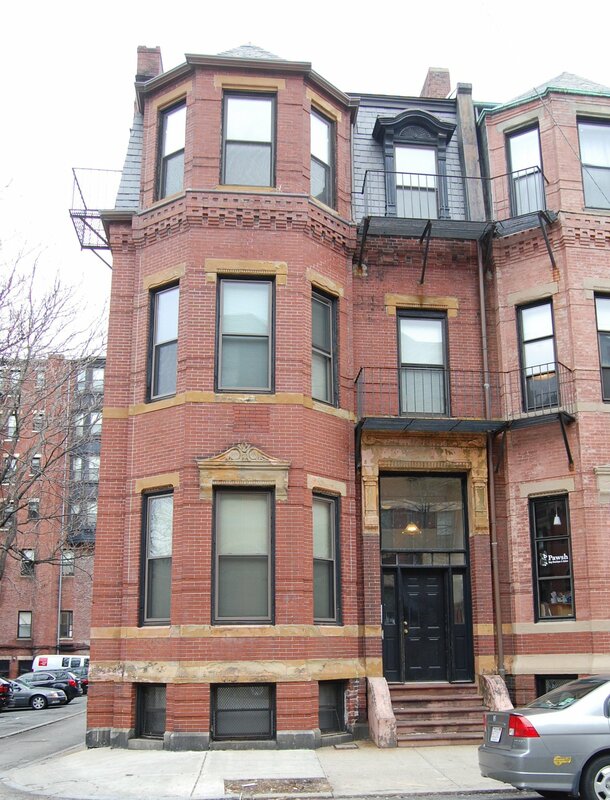 She continued to live at 29 Gloucester until her death in June of 1894. 29 Gloucester was not listed in the 1895 Blue Book. By the 1895-1896 winter season, 29 Gloucester was the home of Anne Pearson (Lunt) Frothingham, the widow of Thomas Bumstead Frothingham. She previously had liged at 16 Exeter (196 Marlborough). Her children lived with her: Dr. Langdon Frothingham, a veterinarian; Louis Adams Frothingham, an attorney and future Speaker of the Massachusetts House of Representatives, Lt. Governor, and US Congressman; and Anne Gorham Frothingham. Langdon Frothingham previously had lived in New Haven, where he had been an instructor and researcher at Yale’s Sheffield Scientific School. Louis and Anne Frothingham had lived with their mother at 16 Exeter (196 Marlborough). Anne (Lunt) Frothingham died in May of 1896. Langdon, Louis, and Anne Frothingham continued to live at 29 Gloucester during the 1898-1899 season, but moved thereafter to 20 Hereford. By the 1899-1900 winter season, 29 Gloucester was the home of John Chase Howe and his wife, Mabel Allison (Yates) Howe. They previously had lived at 31 Gloucester. John Howe was a dealer in dye stuffs, paint, and isinglass in the firm of Howe & French. Living with them were Walter Yates, a ship chandler, and his wife, Marie (Howe) Yates. Walter Yates was Mabel (Yates) Howe’s brother and Marie (Howe) Yates was John Howe’s daughter by his first marriage, to Mary Gore (Ripley) Howe. They had lived with John and Mabel Howe at 31 Gloucester. John Howe died in September of 1901. Mabel Howe and Walter and Marie Yates continued to live at 29 Gloucester during the 1901-1902 season, but moved thereafter to 34 Gloucester (which Walter and Marie Yates had owned and leased to others since August of 1897). 29 Gloucester was not listed in the 1903 Blue Book. By the 1903-1904 winter season, 29 Gloucester was the home of Dr. Franz Ludwig Friedrich Ernst Pfaff and his wife, Hermine. They previously had lived at 871 Boylston. He was a physician and a professor of pharmacology at Harvard Medical School, and a noted expert on poison ivy and poison oak. They continued to live at 29 Gloucester during the 1912-1913 season, after which they made the Hotel Lenox at 61 Exeter their home. By the 1913-1914 winter season, 29 Gloucester was the home and medical office of Dr. John Bromham Hawes, II, and his wife, Cornelia Laurence (Hyatt) Hawes. They previously had lived at the Hotel Royal at 295-297 Beacon. John Hawes was a physician specializing in tuberculosis and other diseases of the lungs. Dr. George Plummer Howe maintained his medical office at 29 Gloucester with Dr. Hawes. He and his wife, Marion Dudley (Endicott) Howe, lived at 154 Beacon with his parents, Dr. Octavius Thorndike Howe and Elizabeth (Plummer) Howe. Interested in anthropology and archaeology, in 1906-1907, George Howe had served as surgeon with Ernest Leffingwell’s expedition to northern Alaska. In the spring of 1917, he volunteered for the Medical Officers Reserve Corps; he was killed in action in September of 1917. John and Cornelia Hawes continued to live at 29 Gloucester during the 1920-1921 winter season. By 1922, they had moved to 36 West Cedar, and his office was located at 11 Marlborough. On October 3, 1921, 29 Gloucester was acquired from Anna Manning by Elizabeth Bertha May (Tucker) Bitzer, the wife of Robert Bitzer. They previously had lived in West Somerville. They also maintained a home in Wollaston. Robert Bitzer was a public school teacher and later would become a professor at Teachers College. The Bitzers regularly accepted several lodgers but, it appears, never changed the legal occupancy from a single-family dwelling. Among the Bitzers’ longer-term lodgers was Dr. Edward Stanley Abbot, who lived there from the 1922-1923 winter season. He previously had lived in Philadelphia, where his wife, Marion (Wetherill) Abbot, died in February of 1922, a suicide. E. Stanley Abbot was a physician and psychiatrist, having spent much of his earlier career on the medical staff of McLean Hospital. He continued to live at 29 Gloucester until 1941. 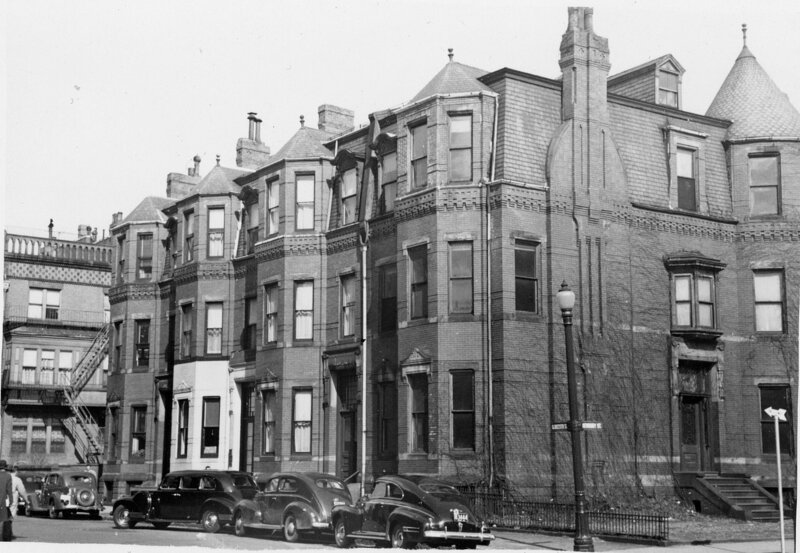 The Bitzers continued to live at 29 Gloucester until about 1946, when they moved to 1069 Boylston. On October 10, 1946, 29 Gloucester was purchased from Robert Bitzer by Elmer Percy Crooker, Jr., trustee of the Bailey Trust. He was a restaurant operator and lived in an apartment at 290 Marlborough. That same month, he applied for (and subsequently received) permission to convert the property into three apartments. On July 12, 1948, 29 Gloucester was purchased from Elmer Crooker by Herbert Tiffany and his wife, Kathleen Elizabeth (Mulvey) Tiffany. They lived in Weston. On July 14, 1951, 29 Gloucester was acquired from the Tiffanys by Bertha Alfreda (Duff) Goodhue, the widow of Robert Wadleigh Goodhue. She lived in an apartment at 288 Commonwealth. That same month, she filed for (and subsequently received) permission to legalize the occupancy of 29 Gloucester as five apartments, indicating that it had been occupied as such when she purchased the property. On April 10, 1957, 29 Gloucester was purchased from Bertha Goodhue by Robert Osborne Tillinghast. He also owned 278–280 Commonwealth and leased 33 Gloucester. In June of 1961, in response to a neighbor’s complaint, a Building Department inspection found that 29 and 33 Gloucester had been occupied illegally as school dormitories by students who “took 2 meals a day at 278 Commonwealth.” That same month, Robert Tillinghast filed for (and subsequently received) permission to install a dining hall in the basement of 278 Commonwealth. In July of 1961, he filed for (and subsequently received) permission to convert 29 Gloucester from five apartments into a lodging house. In April of 1962, he filed for (and subsequently received) permission to convert the property from a lodging house into a dormitory. At the same time, he filed a similar application to convert 278-280 Commonwealth into a dormitory. In the early 1960s, 29 Gloucester was a dormitory, Gloucester Hall, for Burdett College students. in February of 1962 Robert Tillinghast acquired 211 Beacon, and in March of 1962, he acquired 34 Gloucester..
On May 7, 1962, 29 Gloucester was acquired from Robert Tillinghast by the First Community Investment Co., Inc. of Lexington. On the same day, it also acquired 278–280 Commonwealth, 211 Beacon, and 34 Gloucester. On July 3, 1962, it transferred the properties to Robert J. McHugh, trustee of the Mifro Realty Trust, and on August 13, 1965, he transferred them back to First Community Investment. In October of 1965, it acquired 282 Commonwealth. On June 13, 1966, 29 Gloucester was acquired from First Community Investment by Chamberlayne School and Chamberlayne Junior College, located at 128 Commonwealth. At the same time, it also acquired 211 Beacon, 34 Gloucester, and 278–280–282 Commonwealth. 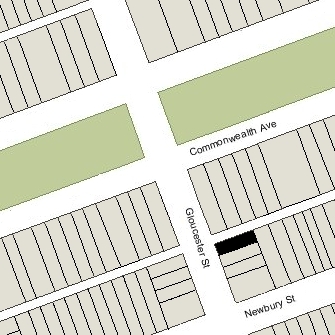 Chamberlayne already owned 260–262–264–266–270–274–276 Commonwealth, which it had acquired earlier in the 1960s. In May of 1968, Chamberlayne applied for (and subsequently received) permission to remodel 29 Gloucester and install a student lounge, reading room, and television room for use by their students. On April 5, 1976, 29 Gloucester was purchased from Bernard Rome by James C. Lawless and his wife, Christina H. Lawless, trustees of Downey Realty Trust. In October of 1978, they also acquired 31 Gloucester. On June 17, 2002, they transferred 29 Gloucester to themselves as trustees of the 29 Gloucester Street Real Estate Trust. In March of 2005, James Lawless filed for (and subsequently received) permission to change the legal occupancy from a dormitory to eight apartments. This was an existing condition and may have been for many years. 29 Gloucester remained an apartment house in 2017.